Zooming Japan suggested Kagoshima City (鹿児島市), Kagoshima Prefecture (鹿児島県), Kagawa Prefecture (香川県), Kanto region (関東地方), karaoke (カラオケ), Kawaguchiko (河口湖 / Lake Kawaguchi), Kamakura (鎌倉), and KAT-TUN (カトゥーン / a boy band); lovelycomplex22 suggested kakigori (かき氷 / shaved ice), KAT-TUN, and Kamenashi Kazuya (亀梨 和也 / an idol, singer and actor); Japan Australia suggested kabuki (歌舞伎 / classical Japanese theatre), kaiseki ryouri (懐石料理 / traditional multi-course dinner), Kamakura, Kamikochi (上高地 / Upper Highlands), and Kanazawa (金沢); Jay Dee suggested Kamakura, Katori Shingo (香取 慎吾 / a member of the band SMAP). Kawasaki City (川崎), Kawasaki the company ((川崎重工業株式会社), kamaboko (蒲鉾 / fish paste), kani (かに / crab), kasutera (カステラ castella cake), Kanazawa, karaoke, and karaage (から揚げ / deep fried meat); UK Seikatsu suggested kamikaze (神風 / divine wind), kare (カレー / Japanese curry), karuta (カルタ / a card game), karate (空手), katana (刀 / Japanese sword), kappa (河童 / a mythical creature), kakizome (書き初め / the first calligraphy written at beginning of a year), kaiseki ryouri, Katsu Shintaro (勝新太郎 / an actor, singer and producer), Carmen Maki (カルメン・マキ / a singer); and Haruko-chan suggested kabuki, Kanazawa and kamikaze. Kamikōchi (translated as the Upper Highlands) is a mountain resort in Nagano Prefecture. Sometimes referred to as the ‘Japanese Yosemite’, this area has been preserved in its natural state and has been designated as one of Japan’s National Cultural Assets. The resort is open from mid-April to November every year, and I imagine it is particularly popular during the autumn foliage season. Just as people love to travel to see cherry blossom in Japan, they also enjoy a trip to see autumn leaves, and Kamikochi looks beautiful at that time of year. 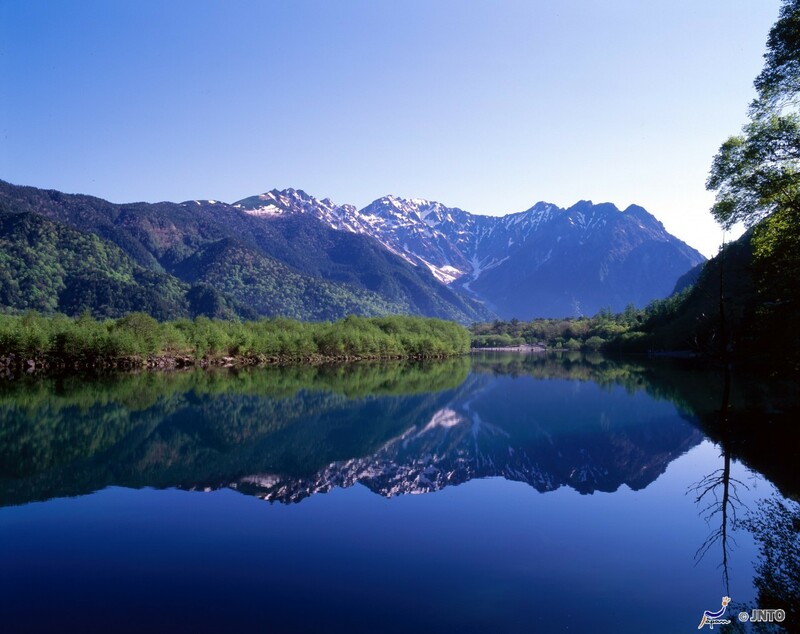 Kamikochi is located in the Hida Mountains, the northern part of the Japanese Alps. It is bordered on its northern end by Mount Hotaka, and on its southern end by Mount Yake, which is an active volcano. The Azusa River flows the length of the valley into Lake Taisho at the base of Mount Yake. Although I’ve referred to Kamikochi as a resort, don’t worry, you won’t find it stuffed with cheap hotels and bursting with tacky souvenirs. The area has only been moderately developed, and there are only half a small number of hotels (both Western-style and Japanese-style) and a few souvenir shops. It is also possible to camp there. Hotels range from about ￥5,250 to ￥52,500 per night (approximately £36 – £360) , and camping starts at about ￥2,000 per person (approximately £14). Hotels have restaurants and also hot spring baths. Kamikochi seems like the ideal place to go if you’re looking to escape from it all and surround yourself with nature. There are hiking trails along the Azusa River, which are suitable for even those of us who don’t hike regularly. The area is also a popular place for mountain climbing, which is something that can be credited to Reverend Walter Weston (1861-1940), an English clergyman, missionary and mountaineer who introduced Kamikochi to the world in the 19th century. Weston apparently lobbied to preserve the area, which was logged extensively until the mid-19th century, and helped to spark an interest in mountaineering in Japan by publishing a book called Mountaineering and Exploration in the Japanese Alps (1896). 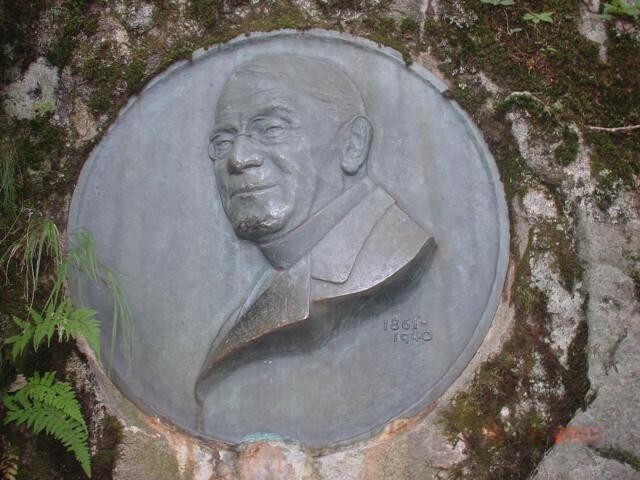 There is a memorial plaque in his honour, which was re-made in 1965 due to it having become badly worn. 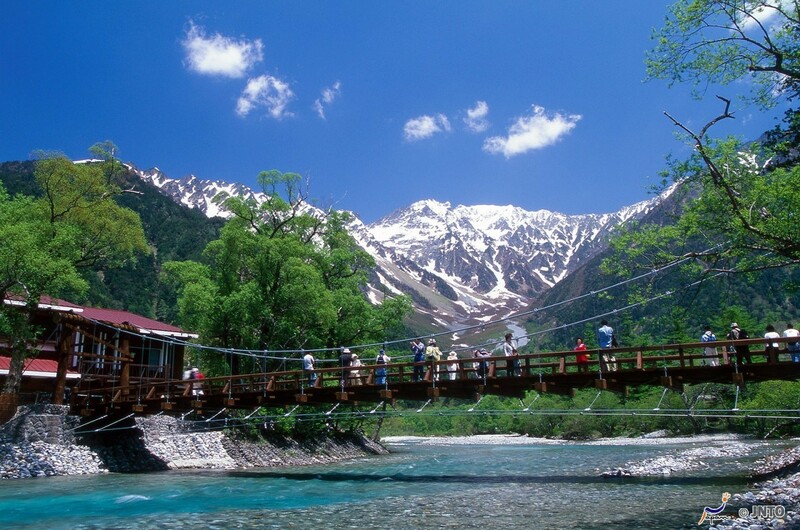 The main tourist attraction in the Kamikochi area (apart from the spectacular mountains) is Kappa Bridge (Kappabashi), a 36.6 metre-long wooden suspension bridge which goes over the Azusa River. As you might recall from my previous blog posts, ‘kappa‘ are mythical creatures, a kind of water sprite, said to live in and near rivers. 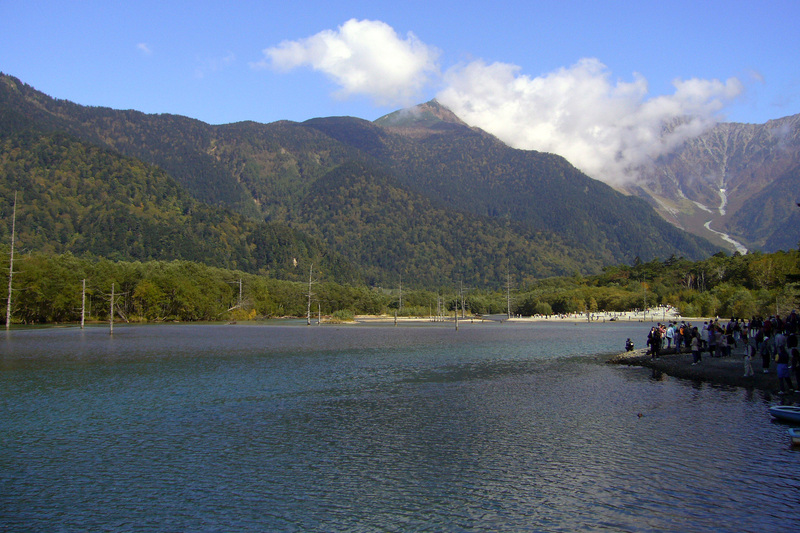 It was believed that kappa lived in Kamikochi, and this could be where the bridge got its name. 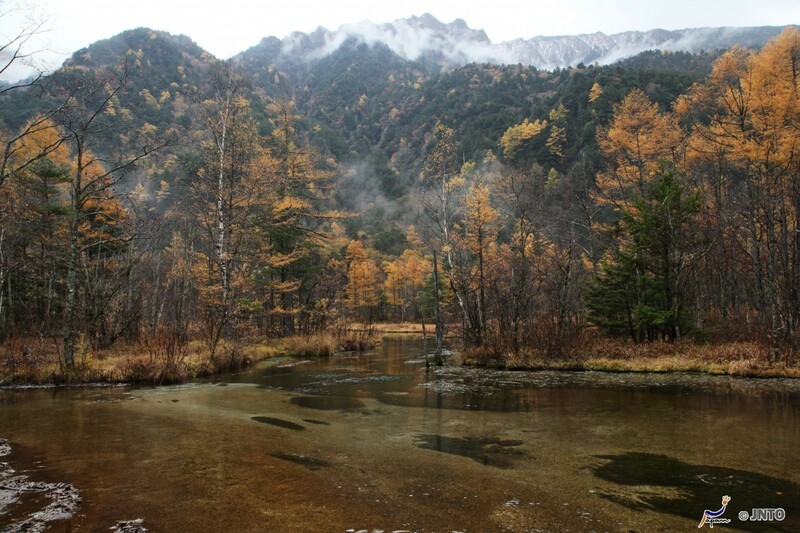 If you’re lucky enough to visit Kamikochi, keep an eye out for wildlife. There are monkeys around, and occasionally bears (although apparently the bears are rarely spotted). As with the famous snow monkeys in Jigokudani Monkey Park in Nagano, the monkeys will tend to leave you alone as long as you don’t do anything to annoy them or make eye contact with them. Accessing Kamikochi is not difficult but can be a bit of a lengthy journey (depending on where you’re coming from of course). If you’re in Tokyo, you can just take the JR Chuo line from Shinjuku to Matsumoto (about 2 hrs 40 mins), and then from Matsumoto take the Matsumoto Dentetsu Line to Shin-Shimashima Station (about 1 hr). 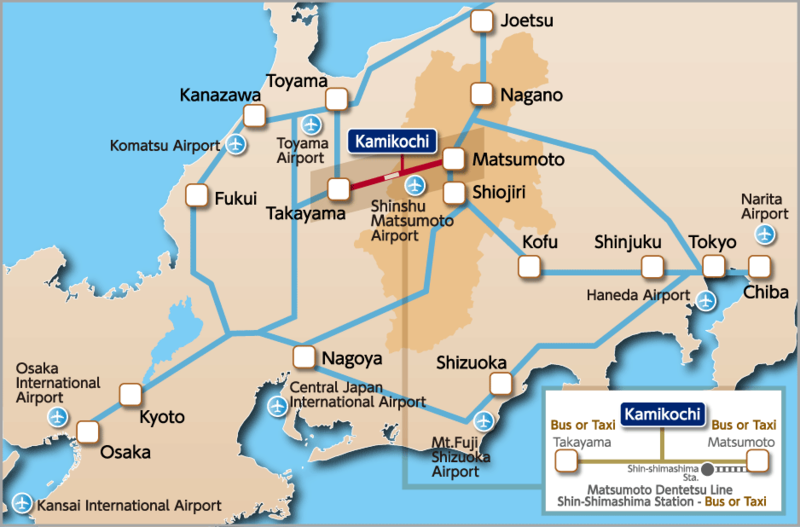 From Shin-Shimashima Station you can take a bus or taxi to Kamikochi. It’s best to approach by public transport, as private cars are banned from the area. 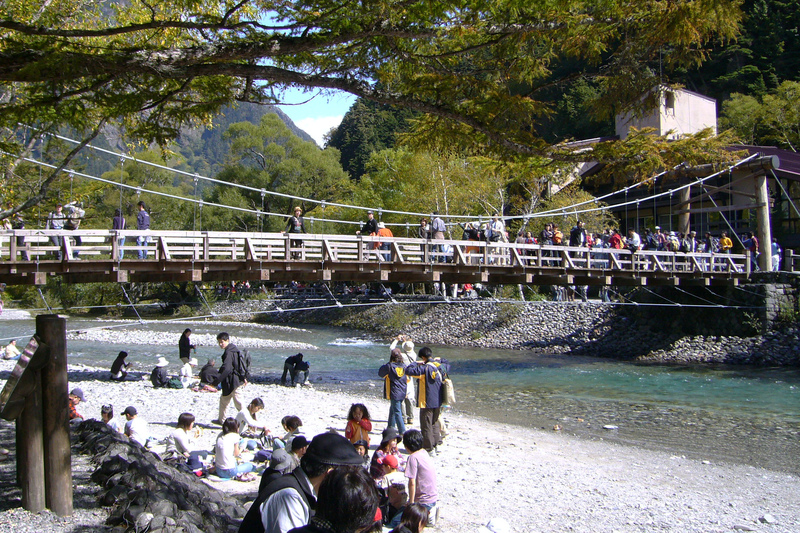 Visit Kamikochi’s official website (in Englilsh) for more information, or visit JNTO. Next week we’ll start with き (ki), so please leave a comment below suggesting a topic for things beginning with き. Topics can be anything, as long as they are connected to Japan – food, places, people, characters, whatever you want to hear about! Just remember that the words you suggest must be Japanese (for example, you can’t suggest ‘kid’ (a young goat) for ‘ki’, because ‘kid’ in Japanese is ‘koyagi’, but you could suggest ‘kitsune’, which is a fox. Thank you for using my suggestion 🙂 Kamikochi is one of the most beautiful places we have visited in Japan and is a great day trip from Takayama in Gifu. A few suggestions for next week include: Kisaragi, Kitsune, Kinki area (also called Kansai) and Kinka (a famous mountain here in Gifu). You’re lucky to have been there – it looks amazing! I wanted to go to Kamikochi last autumn, but as it’s far away, I just couldn’t make it. It does look beautiful, doesn’t it? Beautiful place! I want to visit it. き, like Kyôto, きょうと, 京都. Kitsune, Kibune, Kinkaku-ji, Kitayama, Kiyomizu-dera, Kinki, Kimono, Kinokuniya. Love snow monkeys in Jigokudani although I have never been there! Image of they are bathing at hot spring makes me smile! If you chose Kyoto, you can also mention famous places start with き or ぎ。if you chose Kitsune Udon, better to introduce Tanuki Udon and also Mujina Udon. Quite lots of Japanese doesn’t know what Mujina Udon is! Snow monkeys make me smile too! (*^_^)v I was so happy when I visited them! Hi, nice to meet you. I watched “Tokyo boy” on TV. You have interested for Japan, I’m glad. Thank you. Thinking about き, only food seems to come to mind. Maybe I’m hungry ^_^ Here goes: kinpira gobo (love it! ), kitsune udon, kimuchi (which I was calling kimochi at first, imagine the waiter’s surprised look when I asked for some kimochi). Wow, so many great suggestions! I vote for kitsune udon (and tanuki too) and how about kinoko? Looks like an amazing place! My suggestions are Kiyomizu-dera, Kinki Kids, Kitano Takeshi, Kit-kat (okay, I know you already have a blog for that), Kita-dake (second tallest mountain in Japan), Kita Alps, and Kyoto.